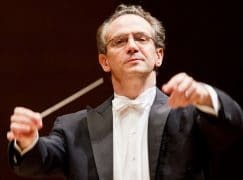 Fabio Luisi, 59, has extended his contract until 2023 with the Danish Radio symphony orchestra. The press release speaks of his ‘great passion for Carl Nielsen’s music’ and upcoming performances by Hans Abrahamsen and Bent Sørensen. ‘With Fabio Luisi in the lead, we find that many new doors are open to the DR Symphony Orchestra,’ says DR boss, Kim Bohr. Never thought I’d see the word “passion” and “Nielsen” in the same sentence. You are missing out if you feel that way about Nielsen. Listen to the symphonies number 3 to 6 (especially #3 and #5), the clarinet concerto and the ballet “Aladdin”. Lots of passion and excitement in all of these! Fantastic conductor. His work in Zurich is outstanding too. Agreed. I miss him at the Met, even if only as a guest conductor. He seems able to conduct anything – Tosca, Wagner, Verdi. Just terrific. PG totally screwed him. I’m so happy for Maestro Luisi that he is welcomed and honored wherever he goes, and for all the right reasons. PG, on the other hand, is shunned. It’s a great orchestra, as are all of the major Scandinavian bands. The question is, if he just got there, how long was his original contract if he’s now only extending to six years? His initial contract was for three years and this extension is for an additional three years. Wondering how much he is actually working in Copenhagen? Somehow the Danish National passed under my radar until now, but there are some very good concert recordings of them on youtube, really impressive. So checking my chances for a weekend trip to Copenhagen and hearing that orchestra under Luisi. But I see only two upcoming concert programs this year. Isn’t that awfully few for a chief conductor? So he isn’t going to the Dallas Symphony as according to some rumors? I hadn’t heard that rumor, but there’s no reason he couldn’t do both if he wanted to. Van Zweden had both Dallas and Hong Kong, after all. You are obviously unaware of the fact he is also the Music Director of the Zurich Opera and the Maggio Fiorentino in Florence. I’ve never quite understood why the Dresden Staatskapelle seemed anxious to jettison F. Luisi. Rumor had it that he wasn’t prepared enough at rehearsals, but I find that hard to believe. I’m guessing it had something to do with differences in temperament, etc. I have several recordings with Luisi and the Staatskapelle, and they’re really excellent: Mahler 1 (dvd); Bruckner 9 (RCA); R. Strauss “Alpine” symphony (RCA). Philadelphia really should make him Principal Guest (the position is vacant). He is a sharp contrast to YNS and is the only living conductor who can get the Sawallisch sound. The Danish Radio Symphony Orchestra aka Danish State Radio Symphony Orchestra was founded in 1925 but had no one was named Conductor, as you say, until Herbert Blomstedt in 1967. Many fine Nielsen recordings were made by it in the 78rpm and mono days with Erik Tuxen, Thomas Jensen and Launy Grondahl. Some might still be available on CD.